Guidelines for understanding the information found in a monster's statistics are presented below. A monster's statistics, sometimes referred to as its stat block, provide the essential information that you need to run the monster. A monster can be Tiny, Small, Medium, Large, Huge, or Gargantuan. The Size Categories table shows how much space a creature of a particular size controls in combat. See the Movement and Position section for more information on creature size and space. Despite the versatile collection of monsters in the Monster Manual, you might be at a loss when it comes to finding the perfect creature for part of an adventure. Feel free to tweak an existing creature to make it into something more useful for you, perhaps by borrowing a trait or two from a different monster or by using a variant or template. Keep in mind that modifying a monster, including when you apply a template to it, might change its challenge rating. A monster's type speaks to its fundamental nature. Certain spells, magic items, class features, and other effects in the game interact in special ways with creatures of a particular type. For example, an arrow of slaying (dragon) deals extra damage not only to dragons but also other creatures of the dragon type, such as dragon turtles and wyverns. The game includes the following monster types, which have no rules of their own. Aberrations are utterly alien beings. Many of them have innate magical abilities drawn from the creature's alien mind rather than the mystical forces of the world. The quintessential aberrations are aboleths, and slaadi. Beasts are nonhumanoid creatures that are a natural part of the fantasy ecology. Some of them have magical powers, but most are unintelligent and lack any society or language. Beasts include all varieties of ordinary animals, dinosaurs, and giant versions of animals. Celestials are creatures native to the Upper Planes. Many of them are the servants of deities, employed as messengers or agents in the mortal realm and throughout the planes. Celestials are good by nature, so the exceptional celestial who strays from a good alignment is a horrifying rarity. Celestials include angels, couatls, and pegasi. Constructs are made, not born. Some are programmed by their creators to follow a simple set of instructions, while others are imbued with sentience and capable of independent thought. Golems are the iconic constructs. Many creatures native to the outer plane of Mechanus, such as modrons, are constructs shaped from the raw material of the plane by the will of more powerful creatures. Elementals are creatures native to the elemental planes. Some creatures of this type are little more than animate masses of their respective elements, including the creatures simply called elementals. Others have biological forms infused with elemental energy. The races of genies, including djinn and efreet, form the most important civilizations on the elemental planes. Other elemental creatures include azers, invisible stalkers, and water weirds. Fey are magical creatures closely tied to the forces of nature. They dwell in twilight groves and misty forests. In some worlds, they are closely tied to the Feywild, also called the Plane of Faerie. Some are also found in the Outer Planes, particularly the planes of Arborea and the Beastlands. Fey include dryads, pixies, and satyrs. Fiends are creatures of wickedness that are native to the Lower Planes. A few are the servants of deities, but many more labor under the leadership of archdevils and demon princes. Evil priests and mages sometimes summon fiends to the material world to do their bidding. If an evil celestial is a rarity, a good fiend is almost inconceivable. Fiends include demons, devils, hell hounds, rakshasas, and yugoloths. Giants tower over humans and their kind. They are humanlike in shape, though some have multiple heads (ettins) or deformities (fomorians). The six varieties of true giant are hill giants, stone giants, frost giants, fire giants, cloud giants, and storm giants. Besides these, creatures such as ogres and trolls are giants. Humanoids are the main peoples of a fantasy gaming world, both civilized and savage, including humans and a tremendous variety of other species. They have language and culture, few if any innate magical abilities (though most humanoids can learn spellcasting), and a bipedal form. The most common humanoid races are the ones most suitable as player characters: humans, dwarves, elves, and halflings. Almost as numerous but far more savage and brutal, and almost uniformly evil, are the races of goblinoids (goblins, hobgoblins, and bugbears), orcs, gnolls, lizardfolk, and kobolds. Monstrosities are monsters in the strictest sense--frightening creatures that are not ordinary, not truly natural, and almost never benign. Some are the results of magical experimentation gone awry (such as owlbears), and others are the product of terrible curses (including minotaurs). They defy categorization, and in some sense serve as a catch-all category for creatures that don't fit into any other type. Oozes are gelatinous creatures that rarely have a fixed shape. They are mostly subterranean, dwelling in caves and dungeons and feeding on refuse, carrion, or creatures unlucky enough to get in their way. Black puddings and gelatinous cubes are among the most recognizable oozes. Plants in this context are vegetable creatures, not ordinary flora. Most of them are ambulatory, and some are carnivorous. The quintessential plants are the shambling mound and the treant. Fungal creatures such as the gas spore and the myconid also fall into this category. A monster might have one or more tags appended to its type, in parentheses. 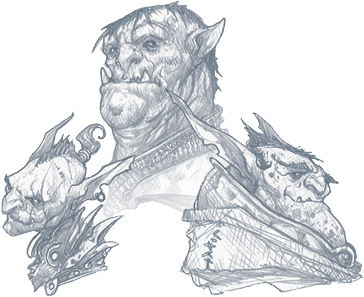 For example, an orc has the humanoid (orc) type. The parenthetical tags provide additional categorization for certain creatures. The tags have no rules of their own, but something in the game, such as a magic item, might refer to them. For instance, a spear that is especially effective at fighting demons would work against any monster that has the demon tag. A monster's alignment provides a clue to its disposition and how it behaves in a roleplaying or combat situation. For example, a chaotic evil monster might be difficult to reason with and might attack characters on sight, whereas a neutral monster might be willing to negotiate. The alignment specified in a monster's stat block is the default. Feel free to depart from it and change a monster's alignment to suit the needs of your campaign. If you want a good-aligned green dragon or an evil storm giant, there's nothing stopping you. Some creatures can have any alignment. In other words, you choose the monster's alignment. Some monster's alignment entry indicates a tendency or aversion toward law, chaos, good, or evil. For example, a berserker can be any chaotic alignment (chaotic good, chaotic neutral, or chaotic evil), as befits its wild nature. Many creatures of low intelligence have no comprehension of law or chaos, good or evil. They don't make moral or ethical choices, but rather act on instinct. These creatures are unaligned, which means they don't have an alignment. A monster that wears armor or carries a shield has an Armor Class (AC) that takes its armor, shield, and Dexterity into account. Otherwise, a monster's AC is based on its Dexterity modifier and natural armor, if any. If a monster has natural armor, wears armor, or carries a shield, this is noted in parentheses after its AC value. A monster usually dies or is destroyed when it drops to 0 hit points. A monster's hit points are presented both as a die expression and as an average number. For example, a monster with 2d8 hit points has 9 hit points on average (2 × 4½). A monster's size determines the die used to calculate its hit points, as shown in the Hit Dice by Size table. A monster's Constitution modifier also affects the number of hit points it has. Its Constitution modifier is multiplied by the number of Hit Dice it possesses, and the result is added to its hit points. For example, if a monster has a Constitution of 12 (+1 modifier) and 2d8 Hit Dice, it has 2d8 + 2 hit points (average 11). A monster's speed tells you how far it can move on its turn. All creatures have a walking speed, simply called the monster's speed. Creatures that have no form of ground-based locomotion have a walking speed of 0 feet. Some creatures have one or more of the following additional movement modes. A monster that has a burrowing speed can use that speed to move through sand, earth, mud, or ice. A monster can't burrow through solid rock unless it has a special trait that allows it to do so. A monster that has a climbing speed can use all or part of its movement to move on vertical surfaces. The monster doesn't need to spend extra movement to climb. A monster that has a flying speed can use all or part of its movement to fly. Some monsters have the ability to hover, which makes them hard to knock out of the air. Such a monster stops hovering when it dies. A monster that has a swimming speed doesn't need to spend extra movement to swim. Every monster has six ability scores (Strength, Dexterity, Constitution, Intelligence, Wisdom, and Charisma) and corresponding modifiers. The Saving Throws entry is reserved for creatures that are adept at resisting certain kinds of effects. For example, a creature that isn't easily charmed or frightened might gain a bonus on its Wisdom saving throws. Most creatures don't have special saving throw bonuses, in which case this section is absent. A saving throw bonus is the sum of a monster's relevant ability modifier and its proficiency bonus, which is determined by the monster's challenge rating (as shown in the Proficiency Bonus by Challenge Rating table). 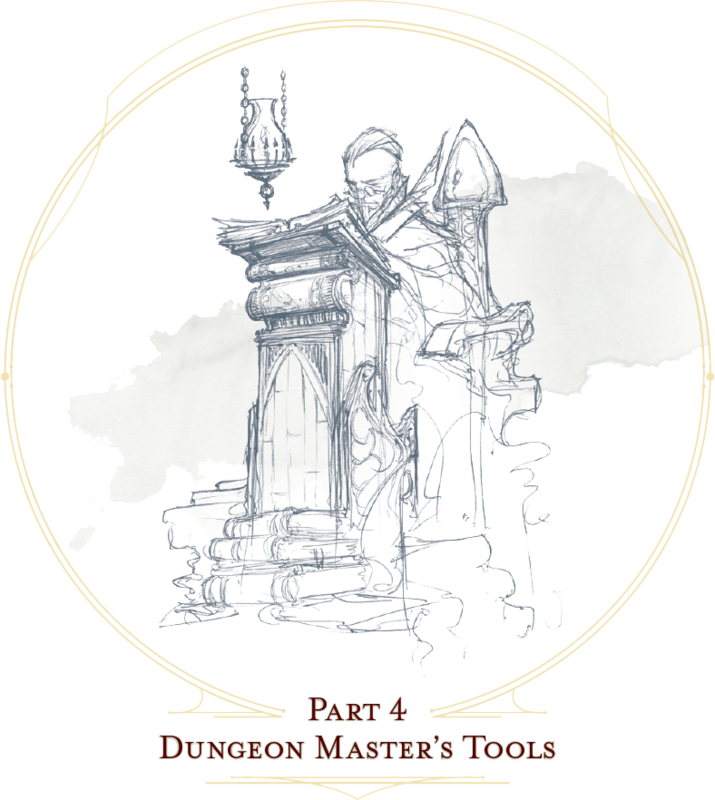 The Skills entry is reserved for monsters that are proficient in one or more skills. For example, a monster that is very perceptive and stealthy might have bonuses to Wisdom (Perception) and Dexterity (Stealth) checks. A skill bonus is the sum of a monster's relevant ability modifier and its proficiency bonus, which is determined by the monster's challenge rating (as shown in the Proficiency Bonus by Challenge Rating table). Other modifiers might apply. For instance, a monster might have a larger-than-expected bonus (usually double its proficiency bonus) to account for its heightened expertise. Assume that a creature is proficient with its armor, weapons, and tools. If you swap them out, you decide whether the creature is proficient with its new equipment. For example, a hill giant typically wears hide armor and wields a greatclub. You could equip a hill giant with chain mail and a greataxe instead, and assume the giant is proficient with both, one or the other, or neither. Some creatures have vulnerability, resistance, or immunity to certain types of damage. Particular creatures are even resistant or immune to damage from nonmagical attacks (a magical attack is an attack delivered by a spell, a magic item, or another magical source). In addition, some creatures are immune to certain conditions. The Senses entry notes a monster's passive Wisdom (Perception) score, as well as any special senses the monster might have. Special senses are described below. A monster with blindsight can perceive its surroundings without relying on sight, within a specific radius. Creatures without eyes, such as grimlocks and gray oozes, typically have this special sense, as do creatures with echolocation or heightened senses, such as bats and true dragons. If a monster is naturally blind, it has a parenthetical note to this effect, indicating that the radius of its blindsight defines the maximum range of its perception. A monster with darkvision can see in the dark within a specific radius. The monster can see in dim light within the radius as if it were bright light, and in darkness as if it were dim light. The monster can't discern color in darkness, only shades of gray. Many creatures that live underground have this special sense. A monster with tremorsense can detect and pinpoint the origin of vibrations within a specific radius, provided that the monster and the source of the vibrations are in contact with the same ground or substance. Tremorsense can't be used to detect flying or incorporeal creatures. Many burrowing creatures, such as ankhegs, have this special sense. A monster with truesight can, out to a specific range, see in normal and magical darkness, see invisible creatures and objects, automatically detect visual illusions and succeed on saving throws against them, and perceive the original form of a shapechanger or a creature that is transformed by magic. Furthermore, the monster can see into the Ethereal Plane within the same range. The languages that a monster can speak are listed in alphabetical order. Sometimes a monster can understand a language but can't speak it, and this is noted in its entry. A "--" indicates that a creature neither speaks nor understands any language. Telepathy is a magical ability that allows a monster to communicate mentally with another creature within a specified range. The contacted creature doesn't need to share a language with the monster to communicate in this way with it, but it must be able to understand at least one language. A creature without telepathy can receive and respond to telepathic messages but can't initiate or terminate a telepathic conversation. A telepathic monster doesn't need to see a contacted creature and can end the telepathic contact at any time. The contact is broken as soon as the two creatures are no longer within range of each other or if the telepathic monster contacts a different creature within range. A telepathic monster can initiate or terminate a telepathic conversation without using an action, but while the monster is incapacitated, it can't initiate telepathic contact, and any current contact is terminated. A creature within the area of an antimagic field or in any other location where magic doesn't function can't send or receive telepathic messages. A monster's challenge rating tells you how great a threat the monster is. An appropriately equipped and well-rested party of four adventurers should be able to defeat a monster that has a challenge rating equal to its level without suffering any deaths. For example, a party of four 3rd-level characters should find a monster with a challenge rating of 3 to be a worthy challenge, but not a deadly one. Monsters that are significantly weaker than 1st- level characters have a challenge rating lower than 1. Monsters with a challenge rating of 0 are insignificant except in large numbers; those with no effective attacks are worth no experience points, while those that have attacks are worth 10 XP each. Some monsters present a greater challenge than even a typical 20th-level party can handle. These monsters have a challenge rating of 21 or higher and are specifically designed to test player skill. The number of experience points (XP) a monster is worth is based on its challenge rating. Typically, XP is awarded for defeating the monster, although the DM may also award XP for neutralizing the threat posed by the monster in some other manner. Unless something tells you otherwise, a monster summoned by a spell or other magical ability is worth the XP noted in its stat block. Special traits (which appear after a monster's challenge rating but before any actions or reactions) are characteristics that are likely to be relevant in a combat encounter and that require some explanation. A monster with the innate ability to cast spells has the Innate Spellcasting special trait. Unless noted otherwise, an innate spell of 1st level or higher is always cast at its lowest possible level and can't be cast at a higher level. If a monster has a cantrip where its level matters and no level is given, use the monster's challenge rating. An innate spell can have special rules or restrictions. For example, a drow mage can innately cast the levitate spell, but the spell has a "self only" restriction, which means that the spell affects only the drow mage. A monster's innate spells can't be swapped out with other spells. If a monster's innate spells don't require attack rolls, no attack bonus is given for them. A monster with the Spellcasting special trait has a spellcaster level and spell slots, which it uses to cast its spells of 1st level and higher. The spellcaster level is also used for any cantrips included in the feature. The monster has a list of spells known or prepared from a specific class. The list might also include spells from a feature in that class, such as the Divine Domain feature of the cleric or the Druid Circle feature of the druid. The monster is considered a member of that class when attuning to or using a magic item that requires membership in the class or access to its spell list. A monster can cast a spell from its list at a higher level if it has the spell slot to do so. For example, a drow mage with the 3rd-level lightning bolt spell can cast it as a 5th-level spell by using one of its 5th-level spell slots. You can change the spells that a monster knows or has prepared, replacing any spell on its spell list with a spell of the same level and from the same class list. If you do so, you might cause the monster to be a greater or lesser threat than suggested by its challenge rating. A monster that casts spells using only the power of its mind has the psionics tag added to its Spellcasting or Innate Spellcasting special trait. This tag carries no special rules of its own, but other parts of the game might refer to it. A monster that has this tag typically doesn't require any components to cast its spells. When a monster takes its action, it can choose from the options in the Actions section of its stat block or use one of the actions available to all creatures, such as the Dash or Hide action. The most common actions that a monster will take in combat are melee and ranged attacks. These can be spell attacks or weapon attacks, where the "weapon" might be a manufactured item or a natural weapon, such as a claw or tail spike. Creature vs. Target. The target of a melee or ranged attack is usually either one creature or one target, the difference being that a "target" can be a creature or an object. Hit. Any damage dealt or other effects that occur as a result of an attack hitting a target are described after the "Hit" notation. You have the option of taking average damage or rolling the damage; for this reason, both the average damage and the die expression are presented. Miss. If an attack has an effect that occurs on a miss, that information is presented after the "Miss:" notation. A creature that can make multiple attacks on its turn has the Multiattack action. A creature can't use Multiattack when making an opportunity attack, which must be a single melee attack. A monster carries enough ammunition to make its ranged attacks. You can assume that a monster has 2d4 pieces of ammunition for a thrown weapon attack, and 2d10 pieces of ammunition for a projectile weapon such as a bow or crossbow. If a monster can do something special with its reaction, that information is contained here. If a creature has no special reaction, this section is absent. Some special abilities have restrictions on the number of times they can be used. X/Day. The notation "X/Day" means a special ability can be used X number of times and that a monster must finish a long rest to regain expended uses. For example, "1/Day" means a special ability can be used once and that the monster must finish a long rest to use it again. Recharge X–Y. The notation "Recharge X–Y" means a monster can use a special ability once and that the ability then has a random chance of recharging during each subsequent round of combat. At the start of each of the monster's turns, roll a d6. If the roll is one of the numbers in the recharge notation, the monster regains the use of the special ability. The ability also recharges when the monster finishes a short or long rest. For example, "Recharge 5–6" means a monster can use the special ability once. Then, at the start of the monster's turn, it regains the use of that ability if it rolls a 5 or 6 on a d6. Recharge after a Short or Long Rest. This notation means that a monster can use a special ability once and then must finish a short or long rest to use it again. Many monsters have special attacks that allow them to quickly grapple prey. When a monster hits with such an attack, it doesn't need to make an additional ability check to determine whether the grapple succeeds, unless the attack says otherwise. A creature grappled by the monster can use its action to try to escape. To do so, it must succeed on a Strength (Athletics) or Dexterity (Acrobatics) check against the escape DC in the monster's stat block. If no escape DC is given, assume the DC is 10 + the monster's Strength (Athletics) modifier. A stat block rarely refers to equipment, other than armor or weapons used by a monster. A creature that customarily wears clothes, such as a humanoid, is assumed to be dressed appropriately. You can equip monsters with additional gear and trinkets however you like, and you decide how much of a monster's equipment is recoverable after the creature is slain and whether any of that equipment is still usable. A battered suit of armor made for a monster is rarely usable by someone else, for instance. If a spellcasting monster needs material components to cast its spells, assume that it has the material components it needs to cast the spells in its stat block. A legendary creature can do things that ordinary creatures can't. It can take special actions outside its turn, and it might exert magical influence for miles around. If a creature assumes the form of a legendary creature, such as through a spell, it doesn't gain that form's legendary actions, lair actions, or regional effects. A legendary creature can take a certain number of special actions--called legendary actions--outside its turn. Only one legendary action option can be used at a time and only at the end of another creature's turn. A creature regains its spent legendary actions at the start of its turn. It can forgo using them, and it can't use them while incapacitated or otherwise unable to take actions. If surprised, it can't use them until after its first turn in the combat. A legendary creature might have a section describing its lair and the special effects it can create while there, either by act of will or simply by being present. Such a section applies only to a legendary creature that spends a great deal of time in its lair. If a legendary creature has lair actions, it can use them to harness the ambient magic in its lair. On initiative count 20 (losing all initiative ties), it can use one of its lair action options. It can't do so while incapacitated or otherwise unable to take actions. If surprised, it can't use one until after its first turn in the combat. The mere presence of a legendary creature can have strange and wondrous effects on its environment, as noted in this section. Regional effects end abruptly or dissipate over time when the legendary creature dies. The Monster Manual contains statistics for various humanoid nonplayer characters (NPCs) that adventurers might encounter during a campaign, including lowly commoners and mighty archmages. Stat blocks can be used to represent both human and nonhuman NPCs. There are many easy ways to customize the NPCs for your home campaign. You can add racial traits to an NPC. For example, a halfling druid might have a speed of 25 feet and the Lucky trait. Adding racial traits to an NPC doesn't alter its challenge rating. For more on racial traits, see the Player's Handbook. One way to customize an NPC spellcaster is to replace one or more of its spells. You can substitute any spell on the NPC's spell list with a different spell of the same level from the same spell list. Swapping spells in this manner doesn't alter an NPC's challenge rating. You can upgrade or downgrade an NPC's armor, or add or switch weapons. Adjustments to Armor Class and damage can change an NPC's challenge rating. The more powerful an NPC, the more likely it has one or more magic items in its possession. An archmage, for example, might have a magic staff or wand, as well as one or more potions and scrolls. Giving an NPC a potent damage-dealing magic item could alter its challenge rating. Acolytes are junior members of a clergy, usually answerable to a priest. They perform a variety of functions in a temple and are granted minor spellcasting power by their deities. Magic Resistance. The archmage has advantage on saving throws against spells and other magical effects. Archmages are powerful (and usually quite old) spellcasters dedicated to the study of the arcane arts. Benevolent ones counsel kings and queens, while evil ones rule as tyrants and pursue lichdom. Those who are neither good nor evil sequester themselves in remote towers to practice their magic without interruption. An archmage typically has one or more apprentice mages, and an archmage’s abode has numerous magical wards and guardians to discourage interlopers. Assassinate. During its first turn, the assassin has advantage on attack rolls against any creature that hasn’t taken a turn. Any hit the assassin scores against a surprised creature is a critical hit. Evasion. If the assassin is subjected to an effect that allows it to make a Dexterity saving throw to take only half damage, the assassin instead takes no damage if it succeeds on the saving throw, and only half damage if it fails. Sneak Attack (1/Turn). The assassin deals an extra 14 (4d6) damage when it hits a target with a weapon attack and has advantage on the attack roll, or when the target is within 5 feet of an ally of the assassin that isn’t incapacitated and the assassin doesn’t have disadvantage on the attack roll. Multiattack. The assassin makes two shortsword attacks. Shortsword. Melee Weapon Attack: +6 to hit, reach 5 ft., one target. Hit: 6 (1d6 + 3) piercing damage, and the target must make a DC 15 Constitution saving throw, taking 24 (7d6) poison damage on a failed save, or half as much damage on a successful one. Light Crossbow. Ranged Weapon Attack: +6 to hit, range 80/320 ft., one target. Hit: 7 (1d8 + 3) piercing damage, and the target must make a DC 15 Constitution saving throw, taking 24 (7d6) poison damage on a failed save, or half as much damage on a successful one. Trained in the use of poison, assassins are remorseless killers who work for nobles, guildmasters, sovereigns, and anyone else who can afford them. Light Crossbow. Ranged Weapon Attack: +3 to hit, range 80 ft./320 ft., one target. Hit: 5 (1d8 + 1) piercing damage. Bandits rove in gangs and are sometimes led by thugs, veterans, or spellcasters. Not all bandits are evil. Oppression, drought, disease, or famine can often drive otherwise honest folk to a life of banditry. Pirates are bandits of the high seas. They might be freebooters interested only in treasure and murder, or they might be privateers sanctioned by the crown to attack and plunder an enemy nation’s vessels. Multiattack. The captain makes three melee attacks: two with its scimitar and one with its dagger. Or the captain makes two ranged attacks with its daggers. Parry. The captain adds 2 to its AC against one melee attack that would hit it. To do so, the captain must see the attacker and be wielding a melee weapon. It takes a strong personality, ruthless cunning, and a silver tongue to keep a gang of bandits in line. The bandit captain has these qualities in spades. In addition to managing a crew of selfish malcontents, the pirate captain is a variation of the bandit captain, with a ship to protect and command. To keep the crew in line, the captain must mete out rewards and punishment on a regular basis. More than treasure, a bandit captain or pirate captain craves infamy. A prisoner who appeals to the captain’s vanity or ego is more likely to be treated fairly than a prisoner who does not or claims not to know anything of the captain’s colorful reputation. Reckless. At the start of its turn, the berserker can gain advantage on all melee weapon attack rolls during that turn, but attack rolls against it have advantage until the start of its next turn. Greataxe. Melee Weapon Attack: +5 to hit, reach 5 ft., one target. Hit: 9 (1d12 + 3) slashing damage. Hailing from uncivilized lands, unpredictable berserkers come together in war parties and seek conflict wherever they can find it. Dark Devotion. The cultist has advantage on saving throws against being charmed or frightened. Scimitar. Melee Weapon Attack: +3 to hit, reach 5 ft., one creature. Hit: 4 (1d6 + 1) slashing damage. Cultists swear allegiance to dark powers such as elemental princes, demon lords, or archdevils. Most conceal their loyalties to avoid being ostracized, imprisoned, or executed for their beliefs. Unlike evil acolytes, cultists often show signs of insanity in their beliefs and practices. Fanatics are often part of a cult’s leadership, using their charisma and dogma to influence and prey on those of weak will. Most are interested in personal power above all else. Quarterstaff. Melee Weapon Attack: +2 to hit (+4 to hit with shillelagh), reach 5 ft., one target. Hit: 3 (1d6) bludgeoning damage, or 4 (1d8 + 2) bludgeoning damage with shillelagh or if wielded with two hands. Druids dwell in forests and other secluded wilderness locations, where they protect the natural world from monsters and the encroachment of civilization. Some are tribal shamans who heal the sick, pray to animal spirits, and provide spiritual guidance. Brave. The gladiator has advantage on saving throws against being frightened. Brute. A melee weapon deals one extra die of its damage when the gladiator hits with it (included in the attack). Multiattack. The gladiator makes three melee attacks or two ranged attacks. Spear. Melee or Ranged Weapon Attack: +7 to hit, reach 5 ft. and range 20/60 ft., one target. Hit: 11 (2d6 + 4) piercing damage, or 13 (2d8 + 4) piercing damage if used with two hands to make a melee attack. Shield Bash. Melee Weapon Attack: +7 to hit, reach 5 ft., one creature. Hit: 9 (2d4 + 4) bludgeoning damage. If the target is a Medium or smaller creature, it must succeed on a DC 15 Strength saving throw or be knocked prone. Parry. The gladiator adds 3 to its AC against one melee attack that would hit it. To do so, the gladiator must see the attacker and be wielding a melee weapon. Gladiators battle for the entertainment of raucous crowds. Some gladiators are brutal pit fighters who treat each match as a life-or-death struggle, while others are professional duelists who command huge fees but rarely fight to the death. Guards include members of a city watch, sentries in a citadel or fortified town, and the bodyguards of merchants and nobles. Brave. The knight has advantage on saving throws against being frightened. Multiattack. The knight makes two melee attacks. Greatsword. Melee Weapon Attack: +5 to hit, reach 5 ft., one target. Hit: 10 (2d6 + 3) slashing damage. Heavy Crossbow. Ranged Weapon Attack: +2 to hit, range 100/400 ft., one target. Hit: 5 (1d10) piercing damage. Leadership (Recharges after a Short or Long Rest). For 1 minute, the knight can utter a special command or warning whenever a nonhostile creature that it can see within 30 feet of it makes an attack roll or a saving throw. The creature can add a d4 to its roll provided it can hear and understand the knight. A creature can benefit from only one Leadership die at a time. This effect ends if the knight is incapacitated. Parry. The knight adds 2 to its AC against one melee attack that would hit it. To do so, the knight must see the attacker and be wielding a melee weapon. Knights are warriors who pledge service to rulers, religious orders, and noble causes. A knight’s alignment determines the extent to which a pledge is honored. Whether undertaking a quest or patrolling a realm, a knight often travels with an entourage that includes squires and hirelings who are commoners. Dagger. Melee or Ranged Weapon Attack: +5 to hit, reach 5 ft. or range 20/60 ft., one target. Hit: 4 (1d4 + 2) piercing damage. Mages spend their lives in the study and practice of magic. Good-aligned mages offer counsel to nobles and others in power, while evil mages dwell in isolated sites to perform unspeakable experiments without interference. Rapier. Melee Weapon Attack: +3 to hit, reach 5 ft., one target. Hit: 5 (1d8 + 1) piercing damage. Parry. The noble adds 2 to its AC against one melee attack that would hit it. To do so, the noble must see the attacker and be wielding a melee weapon. Nobles wield great authority and influence as members of the upper class, possessing wealth and connections that can make them as powerful as monarchs and generals. A noble often travels in the company of guards, as well as servants who are commoners. The noble’s statistics can also be used to represent courtiers who aren’t of noble birth. Divine Eminence. As a bonus action, the priest can expend a spell slot to cause its melee weapon attacks to magically deal an extra 10 (3d6) radiant damage to a target on a hit. This benefit lasts until the end of the turn. If the priest expends a spell slot of 2nd level or higher, the extra damage increases by 1d6 for each level above 1st. Mace. Melee Weapon Attack: +2 to hit, reach 5 ft., one target. Hit: 3 (1d6) bludgeoning damage. Priests bring the teachings of their gods to the common folk. They are the spiritual leaders of temples and shrines and often hold positions of influence in their communities. Evil priests might work openly under a tyrant, or they might be the leaders of religious sects hidden in the shadows of good society, overseeing depraved rites. A priest typically has one or more acolytes to help with religious ceremonies and other sacred duties. Keen Hearing and Sight. The scout has advantage on Wisdom (Perception) checks that rely on hearing or sight. Multiattack. The scout makes two melee attacks or two ranged attacks. Shortsword. Melee Weapon Attack: +4 to hit, reach 5 ft., one target. Hit: 5 (1d6 + 2) piercing damage. Longbow. Ranged Weapon Attack: +4 to hit, ranged 150/600 ft., one target. Hit: 6 (1d8 + 2) piercing damage. Scouts are skilled hunters and trackers who offer their services for a fee. Most hunt wild game, but a few work as bounty hunters, serve as guides, or provide military reconnaissance. Cunning Action. On each of its turns, the spy can use a bonus action to take the Dash, Disengage, or Hide action. Sneak Attack (1/Turn). The spy deals an extra 7 (2d6) damage when it hits a target with a weapon attack and has advantage on the attack roll, or when the target is within 5 feet of an ally of the spy that isn’t incapacitated and the spy doesn’t have disadvantage on the attack roll. Multiattack. The spy makes two melee attacks. Hand Crossbow. Ranged Weapon Attack: +4 to hit, range 30/120 ft., one target. Hit: 5 (1d6 + 2) piercing damage. Rulers, nobles, merchants, guildmasters, and other wealthy individuals use spies to gain the upper hand in a world of cutthroat politics. A spy is trained to secretly gather information. Loyal spies would rather die than divulge information that could compromise them or their employers. Pack Tactics. The thug has advantage on an attack roll against a creature if at least one of the thug’s allies is within 5 feet of the creature and the ally isn’t incapacitated. Multiattack. The thug makes two melee attacks. Mace. Melee Weapon Attack: +4 to hit, reach 5 ft., one creature. Hit: 5 (1d6 + 2) bludgeoning damage. Thugs are ruthless enforcers skilled at intimidation and violence. They work for money and have few scruples. Pack Tactics. The warrior has advantage on an attack roll against a creature if at least one of the warrior’s allies is within 5 feet of the creature and the ally isn’t incapacitated. Tribal warriors live beyond civilization, most often subsisting on fishing and hunting. Each tribe acts in accordance with the wishes of its chief, who is the greatest or oldest warrior of the tribe or a tribe member blessed by the gods. Veterans are professional fighters that take up arms for pay or to protect something they believe in or value. Their ranks include soldiers retired from long service and warriors who never served anyone but themselves.